Whether you have a few houses that need managed or you’re moving out of state, finding a good property manager is hard work. There are a lot of things to consider, and the interview process can be very tedious. Being a landlord is not all about flexible hours and passive income. It's hard work. It's a lot to handle even when you have a single rental property. Start adding more properties to the portfolio, or move out of town, and the whole management process becomes overwhelming for many landlords. That's when most people start looking into hiring a professional property management company to handle all of these responsibilities. 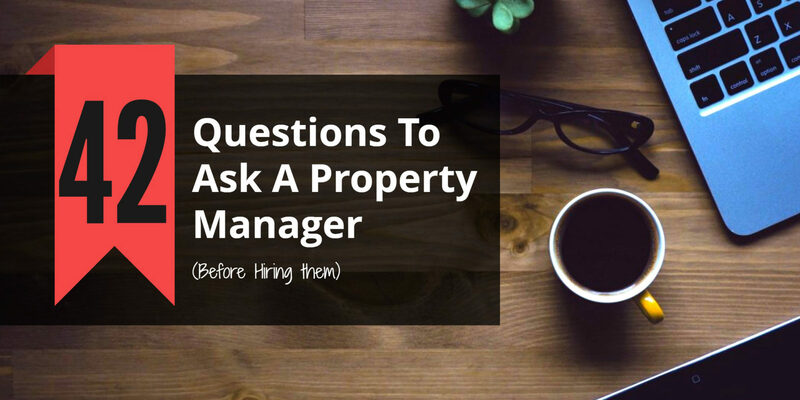 Obviously there are a lot of other things that go into being a successful property manager, but I'll stop with that list. At the end of the day, whether you have one property or a hundred, you only want to work with managers that hold the traits listed above, and will be able to keep your rentals occupied, maintained, and your tenants happy. How do you find a quality property management company? Below, we have compiled a list of 42 questions you need to ask during the interview process. The answers to these questions will help you separate the over-achievers from the middle-of-the-pack managers. The questions are broken down into related categories. Feel free to click the links and jump ahead to different sections. If you're looking for a visual shortlist, we've compiled 14 of the most important in the infographic below. If you want to read full post instead, click here. This question will help you gauge how much experience the management company has. If you’re looking for someone to manage a rental investment it’s likely because you don’t have the experience, time or proximity. As a general rule, look for companies with a minimum 5+ years experience managing similar property types in your geographic location. #2: How many rental properties do you manage? This will help you gauge the size of the company, and understand the manager's experience level further. Look for companies with at least 50 properties in their portfolio. #3: Where are most of your properties located? a). Does the company understand the area your property is located in? b). Do they manage properties outside your current investment area? The second question is important because you may want to expand outside the immediate area your current rental is located in. It's important to keep management under a single company. You don't want to have one company managing rentals in Idaho﻿﻿ Falls, and another one in Pocatello, for example. #4: What type of organizations are you involved in? Do they belong professional organizations like the National Association of Residential Property Managers (NARPM) or Institute of Real Estate Managers (IREM)? How about local realtors association? The answers to those questions will provide a good indicator of their professionalism and efforts to stay current on the latest management principles and local real estate trends. #5: How do you determine rent prices? Any credible management company should be able to conduct a comparable market analysis to pinpoint optimal rental prices across different properties and geographic locations. This will help you reduce vacancy, while maximizing cash flow. #6: What type of properties do you currently manage? What is the portfolio breakdown? If the company doesn't manage your property type, don't let them start with your's. This is a recipe for disaster. For example, if they specialize in single family houses, don't let them manage your apartment or condo. Most companies will manage a range of residential property types - single family home, du-plex, tri-plex, apartments, condos. #7: Do you personally invest in the local market? The company's leadership should be investors in the local real estate market. There is no better way to learn than by actually doing. They should practice what they preach. #8: Can you explain the Fair Housing Laws? This is a good screening question. Every PM company should know them. A violation could land you in hit water. #9: What type of insurance do you carry? A good management company should carry a large general liability policy, and an errors and omissions policy. These two types of insurance will help keep you covered and protects you from clerical mistakes. #10: Can I cancel my contract without a fee if I’m unhappy? Contracts can be tricky, so try to not get locked into a contract you can’t get out of. A company that holds you hostage to a contract isn’t one you want to work with. Contract length should be a by-product of performance. #11: How many managers do you employ? Once you know how many properties are under management, this will help you determine the manager-properties ratio. Generally, you should not have more than 50 units per manager to help provide responsive service to both owners and tenants. #12: What does your lease look like? Request to look at a sample lease. Most companies will use the local association of realtors lease, which has been drafted by attorneys to comply with local laws and property codes. This lease will contain provisions to limit the landlord's legal exposure. #13: Are there fees when the property has no tenants? This is an important question to ask. If a “flat rate” has been agreed upon, the company will still charge you fees, even if the property is empty. This begs the question, why would the management company want to fill the vacancy if they can still make money without tenants? Look for a company that will only charge a percentage of collected rents. #14: What are the monthly management fees? This is usually 6-10% of the monthly rent. Make sure you have enough room to be cash flow positive, or are prepared to absorb the difference. #15. Are there fees if I want to switch companies? Not only will some companies try and tie you into a contract, some will charge you for leaving. This is not uncommon. Avoid companies that demand a separation fee. The length of the contract should hinge on the quality of their service. If service is poor, you should be able to leave without a penalty. #16: What miscellaneous fees could I be charged? If it is a screaming deal to sign with a management company, it is probably because the company has ulterior motives. A management company has to make money, so offering a low monthly fee, means they will make up the costs elsewhere...aka, charging lots of extra fees - admin fees, letting fees, advertising fees an﻿﻿﻿d more. #17: What are your leasing fees and do they include marketing costs? The charges for a first time lease signer should be different than a tenant who is re-signing a lease. As mentioned above, there are often many hidden management costs you don't find about until you go to sign on the dotted line. Find out if marketing costs are bundled into the leasing fees. If not, you could be looking at some significant hidden fees down the road. #18: How do you find quality tenants? Property managers should want to have quality tenants, because it shows they are doing their due diligence in the background screens that include prior evictions, criminal history, and credit checks. There should be a clearly defined process to finding and screening quality tenants. This is our 7-step process. #19: What are your income requirements for tenants? The average requirement should usually be 3x the month’s rent. #20: How soon do you start evictions? The eviction process should (legally) start as early as possible. It could take over a month for the process to be completed. That is an extra month you’re not getting paid. Make sure your eviction policy is clearly outlined in the rental agreement, and reiterated verbally to the prospective tenant before signing. #21: Do you require tenants to have renter’s insurance? Renter’s insurance costs the property manager and the owner nothing, but it does protect you (the owner) if something goes wrong. You don’t want to have to cover insurance or legal fees if a dog bites a human, or if there is fire or flood. Make sure the company you are interviewing requires renter's insurance. #22: Do you select tenants or do I approve them? You should be as hands on or off as you want with this, but the property manager should be finding the tenants, and if you’re wanting final say, you should have it. Set your expectations with the manager before signing. #23: How often will I get updates on my property? You should get updates on your property as often as you need them. As a general rule, they should come as frequently as your payment statements. Our company providers access to an owner's portal where owners can access property performance data and accounting information on demand. #24: Do tenants have direct access to owners? You hired a management company for a good reason. One of those is to avoid having to deal directly with tenants. It’s good to have a barrier between you and the tenant. This way it helps keep communication consistent, and frees up time to focus on other areas of your life and business. #25: What is the owner/tenant response time? You don’t want your property to sit empty, and if your property manager has a slow response time, it just might stay empty. Same goes with if you have questions for the manager. They should be available and get back to you with a quick answer. See if the company has a policy around response times. Poor response time is one of the top complaints of tenants, and a leading reason why they break lease or spread negative word of mouth. #26: What services are offered to clients? It’s a no-brainer management companies should be able to market, lease, manage, and possibly sell your property. But do they offer in-depth background screens, excellent maintenance and inspect properties regularly? They should. #27: How do you collect rent from tenants? Do you offer direct deposit for owners? Do tenants have to write a check and deliver it to the office? Let’s face it, it’s 2016, online payments should be an acceptable form of payment. This will ensure faster payment. Direct deposits should either be offered, or made compulsory. #28: What is your rental marketing strategy? Marketing has now moved past road signs and classified ads in newspapers. Today, people consume most of their content online - on mobile devices. An integrated marketing strategy - SEO, PPC, social media, email, review management, responsive web design - is needed to break through the noise and attract qualified tenants. Here is an article written by our President, Jake Durtschi, on Appfolio that will give you a good idea of the integrated approach we use to market rentals, and maintain an average vacancy rate below 2%. #29: Do you guarantee occupancy? If the manager can’t guarantee tenants will stick around for any amount of time (without needing to evict), maybe their screening process is flawed. At a minimum, ask for an average occupancy rate. To give you an idea of what to look for, Jacob Grant's average occupancy rate is 98%, thanks in large part to the lease renewal strategy we have in place. Jake discusses explains in this Inman article. #30: What percentage of tenants renew their leases? The lease renewal rate for a good property manager will usually be in 80 percent or higher ranges. A critical component of any tenant retention process should be having a clearly defined lease renewal strategy. #31: What is your average vacancy rate? This is a good question, just so you can be prepared to know how much income should be coming in. A vacancy rate for a good management company, should not be above 4-5 percent. #32: What is your average eviction rate? Eviction rates are usually a by-product of the screening process. A high eviction rate is a big red flag. They should be an absolute last resort actions. Anything above 1-2% should be a big turnoff. On the flip side, beware of managers who claim they never have to evict. #33: What percentage of the security deposit is usually refunded? This percentage should be high - a low refund rate can indicate management is doing a poor job pre-screening ﻿tenants﻿, or they are excessively penalizing them upon move out. The latter will upset tenants and create a lot of negative word of mouth for your property. #34: What is your average owner retention rate? Shoot for companies with above 97% owner retention rate. Inevitably, there will be attrition in any business. But, in this industry it should be really low. Higher turnover rates are a big red flag when it comes to quality management service. #35: What is the average occupancy length? Ideally, you want to have most tenants renew their lease, or at a minimum stay for the full lease term. High renewal rates and long occupancy periods are a good sign of quality tenants and good customer service. #36: Is there a maintenance reserve requirement? Again, you can be hands on or hands off depending on how much is required for a reserve. You don’t want to be called every time a dryer hose needs replaced, but you also want to their to be some transparency. One option here is to set a maintenance threshold. Only repairs exceeding a certain amount will require owner notification. #37: Who handles yard maintenance? Some managers have a dedicated maintenance crew for handling this, but usually the yard is taken care of by the tenant. #38: Do you mark-up maintenance and repairs? You have a reserve for maintenance and repairs. If the manager is marking up the cost to tenants, its usually to get a cut of the money. They should never make a profit on repairs or maintenance. #39: How do you handle maintenance requests? Is there a ticketing system in place? Make sure property maintenance requests don’t get lost in a stack of sticky notes or shuffled papers. Slow response time to maintenance requests will upset tenants and reduce the likelihood of a lease renewal. #40: Do you provide any maintenance discounts? In most cases a property manager will have contractors they do regular business with that give discounts. But if you’re handling the property yourself, you won’t have those relationships, and may be charged more. #41: Is there a move-in and move-out checklist? #42: Can you provide advice for growing my portfolio? A lot of property owners are looking to build portfolios containing multiple rental investments. It's definitely an advantage to work with a management company that can educate you about smart invest opportunities in the local market, and help you build out a portfolio that not only generates positive cash flow, but appreciates steadily over time.